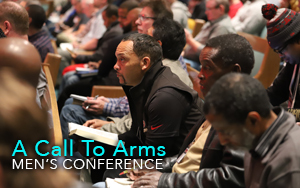 Hundreds of men gathered on the Rhema USA campus on November 1–3 to hone their faith, be built up in the Lord, and live above the attacks of the devil. Speakers at CTA aimed to strengthen, challenge, and encourage those who attended. The men left refreshed and better equipped to enforce the victory Jesus has already won for them. Be sure to join us next year for A Call to Arms 2019, to be held November 7-9, 2019.